Virginia Tech Hokies cornerback Kyle Fuller (17) reacts after an interception as cornerback Kendall Fuller (11) and North Carolina Tar Heels defensive lineman Allen Champagne (91) look on. 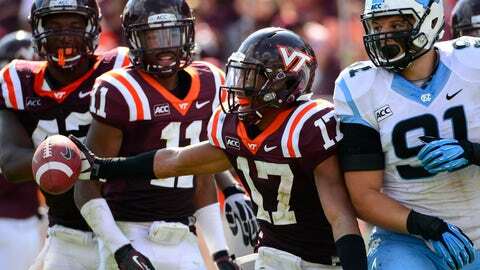 The Hokies defeated the Tar Heels 27-17 at Lane Stadium. With nearly two months before the draft takes place and the entire free agency period, much will change, but here’s how we see it now. With the first 10 days of free agency already having taking place, some of the needs of the teams have changed. Our Top 10 has just two changes with the Jaguars selecting QB Blake Bortles at three and the Vikings taking QB Teddy Bridgewater at eight. The Browns free agency efforts thus far have yielded three defensive players and three on offense. The big money for the Browns thus far has spent on the defense in safety Donte Whitner and linebacker Karlos Dansby, thus bolstering the thought at this point they will focus on offense in the draft. By dropping quarterbacks Brandon Weeden and Jason Campbell, it is apparent the Browns are going to add one or two quarterbacks. However, for now, we’re still sticking with Sammy Watkins as the Browns first pick. However, we’ve changed the next two Browns picks to cornerback Kyle Fuller from Virginia Tech and then quarterback Derek Carr at the top of the second-round. In our first Mock Draft, we projected ILB C.J. Mosely at 26 but have him going 17 to the Ravens this week. The Browns have shown that they were interested in a cornerback as they have tried to trade for CB Darrelle Revis and were interested in Dominque-Rodgers Cromartie as a free agent before he signed with the Giants. 4. BROWNS–SAMMY WATKINS, WR, Clemson–For the third week in a row, we still have the Browns adding the best play making WR opposite of Josh Gordon to give team immediate game breaking weapons. Rather than take a QB they don’t feel is the ‘franchise’ guy, they add a big weapon for Brian Hoyer. This also adds insurance in case of a Gordon mishap along the way. However, more and more of the experts are now projecting Watkins to go to the Rams at two. 10.LIONS–Justin Gilbert, CB, Oklahoma St.
15. STEELERS–Darqueze Dennard, CB, Michigan St.
26. BROWNS–KYLE FULLER, CB, VIRGINIA TECH — Browns need a starting caliber CB to play opposite Joe Haden and allow Buster Skrine to move inside and were unable to land one in free agency. Browns showed they want a cornerback by pursuing Revis and Rodgers-Cromartie. 35. DEREK CARR, QB, Fresno St.–The Browns take Carr and let Brian Hoyer quarterback the team while allowing the rookie to develop. Sleeper pick at 35: XAVIER SU’A-FILO, OG, UCLA. The signing of RB Ben Tate likely will take the Browns out of taking a running back with one of their first three picks. However, look for them to add a back sometime in the draft.